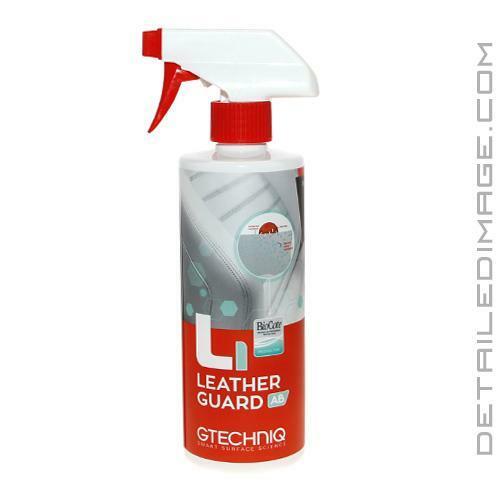 Protects leather from stains and wear! Gtechniq L1 Leather Guard AB will protect your leather and vinyl seats from wear and staining! For the best longevity of your leather seats you want to keep them clean, nourished and protected. L1 will coat the leather with a protective layer that is super easy to apply. Simply spray on a thin layer of L1 to a clean leather seat and allow the product to dry for 30 minutes before use. For the very best results clean and then reapply a coat of L1 on high wear areas every 3 months and for less stressed leather, every 6 months. This Leather Guard will greatly reduce instances of wear on prone areas of leather or vinyl seats (i.e. piping, edges, etc.) and it makes any dye transfer much easier to remove! With the added feature of BioCote, this antimicrobial technology helps kill 99.9% of bacteria on any surface treated with L1. If you are looking for a way to keep your leather protected from wear and contamination, the Gtechniq L1 Leather Guard AB is your answer! Thoroughly clean and dry surfaces. Allow film to dry and then buff with a second lint-free cloth. For optimum performance apply two coats of L1 allowing 24 hours between applications. I am impressed with the Gtechniq L1 leather guard. It provides water resistant, uv, antibacterial, and anti-abrasion properties to your seats for up to 6 months (though I apply every 2-3 months). The application is fairly easy, though you still have to apply a little elbow grease. Once applied your leather feels softer, looks very natural/matte, and there is no unpleasant odor. It is important to note 4 things here though. One, this is not a cleaner. L1 is a guard so this is something you do after you clean your seats. Two, even if your seats look clean be sure to clean your seats before applying the L1 guard. You will thank yourself as it goes on a lot easier and streak free. Three, don't let it set for 5-10 minutes. I found when I let it set and dry that it can be smudgy. Apply a healthy portion of L1 and once the wet look starts to fade buff the guard away with a microfiber buff towel. Finally, apply the L1 guard in sections. I have found it is better when I do the bottom portion seat, and upper seat separately as opposed to all at once. Great product though that I would recommend. Easy to apply and buff off any excess. Leaves a matte finish and leather feels like new. Unsure on longevity or water repellency properties, but this is not a "ceramic" coating for leather, just a durability booster product. Worth it especially for high wear areas like side bolsters, steering wheels and headrests, armrests or center consoles.